t's one of the most storied days on Australia's sporting calendar. 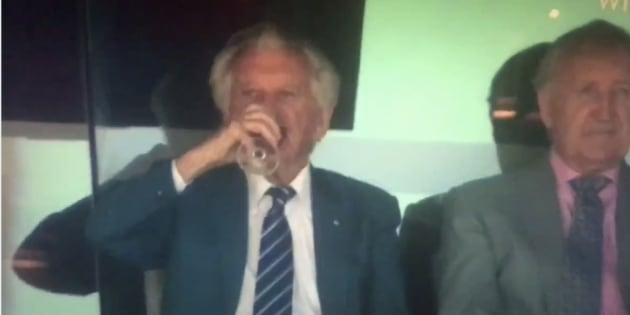 It's one of the most storied days on Australia's sporting calendar -- former Prime Minister Bob Hawke just inhaled another glass of beer at the Sydney test cricket match, an annual tradition eagerly anticipated by millions around the country. Hawke, in addition to being Australia's 23rd PM, formerly held the world record for fastest drinking of a yard of beer, downing the 1.4 litres in just 11 seconds. The 88-year-old's drinking feats are so memorialised that he even launched his own range of beer earlier this year. Now, each year at the Sydney test, Hawke delights punters by absolutely smashing a cup of the good stuff, which is usually broadcast on the big screen at the stadium and watched by millions on TV. In 2018, it was no different, as the former PM went for broke on the second morning of the test match. It took the seasoned drinker a little longer than usual this year, and at one point it looked like he would be defeated and unable to skol it in one, but like a true champion he dug deep and managed to get it all down. Fans were right behind it, cheering Hawkie on from home. An #ashes tradition. Former Australian Prime Minister Bob Hawke pounds a beer at the Sydney Cricket Ground. However, others criticised the celebration of drinking and cricketing commentators in the media egging Hawke on. And we wonder why we have a binge drinking culture when #ShaneWarne goes to great lengths to describe Bob Hawke drinking a beer instead of commentating. Nonetheless, Hawke has been doing this at the Sydney test since at least 2012, and shows no signs of letting up anytime soon.